Reloading saves shooters money, but it’s only going to work if you have the best case trimmer on hand. There are thousands of case trimmers online but no need to go over each one as I’ve handpicked the top 4. I have spent hundreds of hours shooting, reloading and trimming cases, and I used my experience while reviewing these case trimmers. Case trimmers may have a single purpose, but that doesn’t mean they work the same way. Some are easier to use than others or come with extra features, so you need to be particular about what you buy. 3 What is a Case Trimmer? 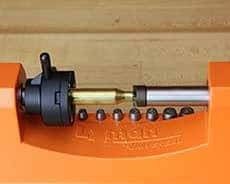 8 Who Makes the Best Case Trimmer for Reloading? What makes the Frankford one of the best rifle case trimmer options is its versatility. You can use this to chamfer and trim all shoulder cartridges ranging from the 17 Remington to the 460, so compatibility is not an issue. The Frankford Arsenal doesn’t need shell holders and trimming is quick. The kit includes chamfer and debur tools, 3 collets, 2 primer pocket cleaners and 6 shoulder bushings. The Arsenal trims brass to your exact specifications and its cutters are very sharp. 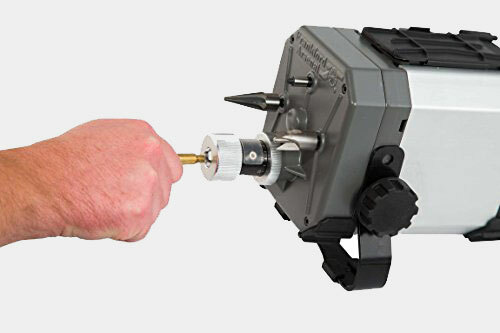 It’s also compatible with any case trimming accessory with 8-32 threads for efficient trimming. Its chamfering tool makes loading quick and doesn’t damage bullets. The kit also includes a large and small pocket cleaner for use on different cases. It’s easy to adjust the collet and the bushing mechanism works great at indexing. After adjusting the case holder, put the brass in and a collet sets the case along the cutter. Overall, operation and performance are very efficient. The Frankford Arsenal Platinum Series comes with a nice set of tools that make case trimming easy. With its bushings, collets and pocket cleaners the Arsenal has one of the best case trimmer kits today. The Lyman comes with a universal chuckhead that’s compatible with 17 to 458 calibers, and it eliminates the need for shell holders or collets. You can also hook up a power adapter for 250 cases an hour trimming. The Lyman also comes with a ring dial adjuster so it’s more convenient to use. The kit includes pilots for the 45, 38/357, 28, 9mm, 30, 27, 24 and 22 caliber. The trimmer uses the proprietary Lyman Universal Chuckhead so it’s easier to use. It’s very sharp and dialing is also precise. The handle is comfortable so you can trim for long periods, and allowing you to set specific lengths is a plus. Lyman weren’t kidding when they said this is a universal case trimmer as it works all the way to the 458. Compatibility with virtually all handguns and rifles add to its functionality. 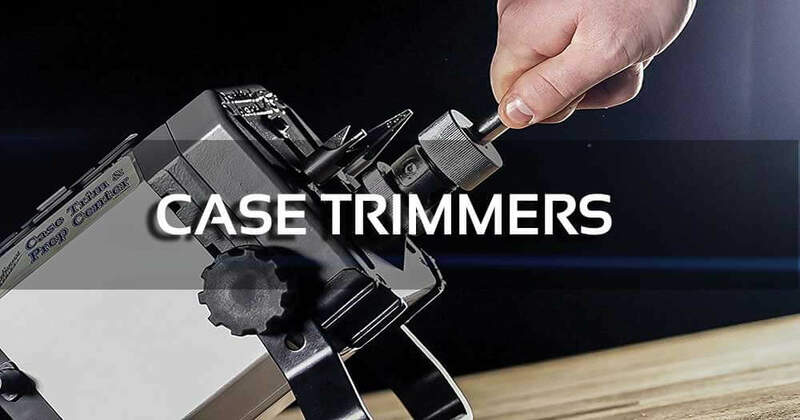 Case trimmer reviews have given the Cam Lock positive feedback, and compared to other trimmers it’s more convenient and powerful. You can bolt the case trimmer and performance wise it’s accurate, sharp and doesn’t cause damage. The sturdy built also means it’s going to last for years even with extended use. The Hornady Cam Lock works with Hornady pilots and shell loaders, making it ideal for any pistol or rifle round. It also sports a sophisticated design so trimming is straightforward. The Hornady Cam Lock is powerful and can handle hundreds or thousands of cases. Unlike other manual trimmers the Cam Lock is more well rounded and provides consistent results. The Hornady trims cases with ease including the 223 caliber and others. Extra size bits are supplied so you won’t have issues with other calibers. This case trimmer cuts brass to the specifications you want without wearing you out. Unlike other trimmers the Hornady isn’t going to tire your fingers even when used regularly. It’s also no surprise this trimmer functions seamlessly with Hornady shell holders. The Hornady 50140 is an excellent manual trimmer, easy to operate and accurate. Quality is excellent and it’s built for long term use as well. The RCBS Trim Pro earns a spot in my best reloading case trimmer list as it offers consistent results. The Trim Pro puts emphasis on compatibility which is why it works with regular pilots. The set has also been crafted to precision so each trim is accurate. The Trim Pro was constructed to withstand wear and tear. The components were also built to prevent damaging the case. The case trimmer has a user friendly design so it’s easy to learn. Trimming results are accurate and the built in power switch is a nice touch. The Trim Pro comes with 9 pilots of varying sizes including 22 to 45. the set also 2, 3, 4 and 10 shell holders for extra versatility. This case trimmer is equipped with a low RPM motor that’s optimized for efficient trimming. It also comes with high torque so you can perform various tasks. The Trim Pro is easy to operate and the simple design will boost your productivity. 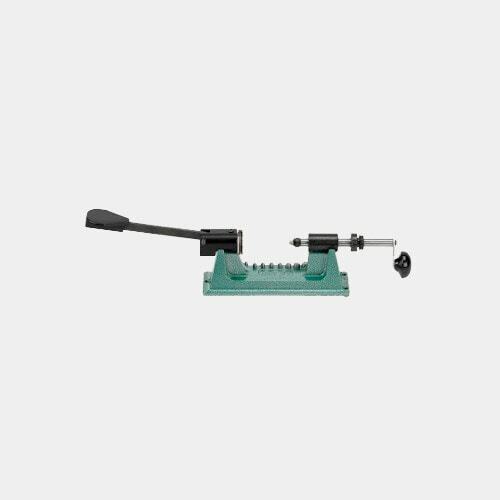 The RCBS is a good case trimmer, with the improved design ideal for different calibers. It’s also durable and offers more in terms of value and efficiency. What is a Case Trimmer? The simplest and the best power case trimmer have the same purpose, trim cases so you can reuse them. Reusing cases saves you money as it allows you to reuse bullets that you’ve fired. As a shooter you can just pick up the rounds you’ve fired and using a case trimmer, trim the round so you can use it again. While this is the basic definition of a case trimmer, the operation and features vary. If you have never used a case trimmer before, it’s a good idea to learn the different types of case trimmers. The following are the most common case trimmers you’ll find. Lathe Systems: the rim is clamped on a holder and on the other side is the trimmer cutter. These are adjustable and allow you to debur, trim and chamfer at the same time. High Volume Precision: these shoulder indexing trim systems work in a similar manner: put your brass in the trimmer and the device trims it like a pencil sharpener. These trimmers are easy to work with. Low Volume Precision: these are simple trimmers that suit those who don’t change calibers often. To replace calibers you just get a new case holder and reset the trimming. On Press Trimming: these trimmers are fast and can debur, chamfer, trim and handle. The trim die and sizing die are the same so when you size it also trims. If you’re looking for a case trimmer for 300 blackout there are several factors you’ll need to mull over. Chamfering and deburring refer to the procedures used to smooth a case after it has been trimmed. There will always be a few edges that need smoothing, but by deburring and chamfering you’ll be able to even these edges out. Some case trimmers are bundled with these tools, which is great. If not it’s easy to find one of these as they’re essential. This is used to hold the shell while you reload and trim. What a shell holder does is keep the case press stable. Case trimmer for 223 shell holders come in different sizes to accommodate the various calibers. That’s why it is crucial you buy a case trimmer which has the specs suitable for your caliber. Polishers and tumblers are used to polish bullets, plus you can use it to polish your guns and extend their lifespan. Many – not all – case trimmers have polishers and/or tumblers built in. No matter what you’re trimming, remember that a consistent length and square mouth are the most important. The case length has to be less than max otherwise the case could grip the bullet too hard. The bottom line is a square mouth leads to more consistent releases, aids in accuracy and enhances bullet entry when seating. This in turn improves your marksmanship. That’s a lot to factor in, but the trimmers reviewed here all adhere to the highest standards and can deliver the results you’re looking for. These trimmers are also suitable for casual competition, plinking and hunting. The following is a general guide to using a case trimmer. Please refer to your manual for more detailed instructions. Mount the case trimmer on a reloading bench at the location you want. Use C clamps or screws to secure it. Some of these case trimmers are bundled with a base plate or stand for greater stability. There should be enough space for you to run the device comfortably. Load a case in the case holder by holding and pushing the lever. Use your free hand to put the case base in, making sure that it’s flushed. To run the trimmer, move the cutter shaft in the direction of the case holder until the cutter and pilot lock in the case’s mouth. Hold the cutting knob, cranking the cutter in a clockwise manner. Keep turning the knob towards the case until finished. Forward pressure should be maintained throughout. The trimming is done when the cutter guide and the adjustment bushings make contact. Move the cutter shaft towards the right. Press the case holder lever and take the trimmed case out. Debur and chamfer the case interior and exterior with chamfer / debur tool. Some case trimmers come with a 3 way tool that trims, chamfer and debur at the same time. You can adjust the length using the adjustment bushing set on the cut shaft. If the case trimmer isn’t running smoothly, you’ll need to do some maintenance work. Often you just need to remove brass debris and shavings and it should run smoothly. It also helps if you lubricate the trimmer after every 300 cases. Any multi-purpose, lightweight grease will do. Grease the cutter shaft, fine adjustment bushing face and case holder lever contact surface. If you’re looking for the best case trimmer for pistol brass, it pays to know the top brands in the market. Hornady Manufacturing began in 1949 with Joyce Hornady, who wanted to start a business that focused on making quality, dependable and affordable bullets. Since the first bullet – a 30 caliber spire point – came out, they’ve expanded operations to include case trimmers and other gun accessories. Lyman is one of the most respected names when it comes to bullet mounds, calibers, case trimmers and reloaders. The history of Lyman goes back to the 1800s when William Lyman created the No. 1 Tang Sight, a major improvement over the vernier sights used back then. Since that time the company has grown and manufactures other products. Frankford Arsenal specializes in reloading and various accessories and equipment. The original FA was built in the early 1800s as an army ammunition plant, and since then it has become well known for its high quality products. RCBS reloading was founded in 1943 by Fred Huntington in his desire for high quality bullets. 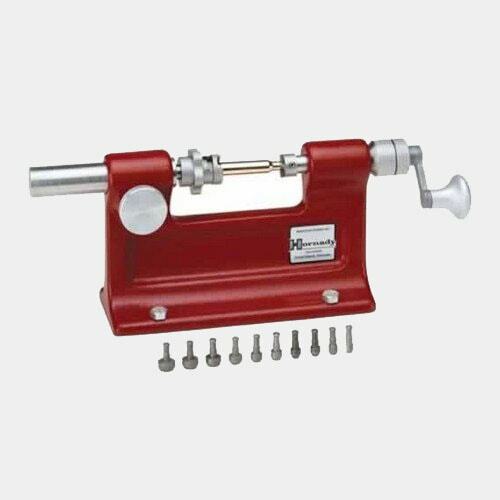 The company grew quickly and today it is known for its case trimmers, reloading dies and other reloading products. Who Makes the Best Case Trimmer for Reloading? All brands will say they make the best case trimmer under 100, 200 or 300 dollars, but only a few of them can actually do that. After a thorough investigation and research, I can say with certainty the four brands above make the finest case trimmers. What really makes them stand out is the way they continue to evolve. These companies have have manufactured a wide range of case trimmers to meet the needs of different shooters. As to which of them is the best, I can say they’re all exceptionally good. Unlike other companies, these four don’t rest on their laurels and always looking for ways to improve their case trimmers. As I pointed out above, these 4 brands are noted for creating quality case trimmers. But there is no doubt in my mind that the Lyman Universal Case Trimmer is the best of the bunch. The Lyman comes with all the essential features you’d expect from a case trimmer and more. It is very accurate, sturdy and made from heavy duty materials. The competition for the best case trimmer is tight, but compared to the rest the Lyman is heads and shoulders above the rest. For consistently good results and ease of use, this is the case trimmer you can count on.